Writing snuck upon me in the guise of a tai tai, a Chinese colloquial term for a woman of leisure. Perched atop a Singapore highrise, I was to take a sabbatical from the life of a corporate road warrior and indulge in some ‘me’ time. And do what expat wives did when their spouses relocated overseas: languorous coffee mornings, salon sessions with girlfriends, retail therapy - the options were beguiling. I tried to resist. After all, I was jobless - by choice, unburdened by motherhood - daughter yet to arrive, in a shiny first world city - ready to explore!, but the neat white Ikea table in my newly-set-up study drew me in repeatedly. There I’d sit after my husband left for office, with my second cup of tea, and memories that rose unbidden, like the fragrance of raat ki rani, the night blooming jasmine in the garden of our home in Ferozepur. All right, I determined, I would offload those memories onto my PC and be done with them. I was naive. One memory led to another, then another, a labyrinth opening up for me to wade in. That period of my life came back to me with the kind of hi-fidelity reproduction enthusiasts wax about. It was the eighties, Khalistan movement was at its peak, Punjab Pulce - as the police is routinely, and with some deprecation, called - was hunting down Sikh militants and notching up its tally of arrests, and men like my father - criminal lawyer by profession, Sikh by faith, Punjabi by nature/upbringing/birth? - got accustomed to being roused by bewildered parents whose sons had been whisked away from homes in the night. Those strapping Sardars, whose forefathers had changed the course of mighty rivers to transform a scrubland into the fertile Punjab of today, who had fought the marauding hordes of Nadir Shah and Abdali, whose toil fed an entire nation, were left hapless in the face of this new adversity: Encounter deaths. To make sense of those memories I started asking questions. 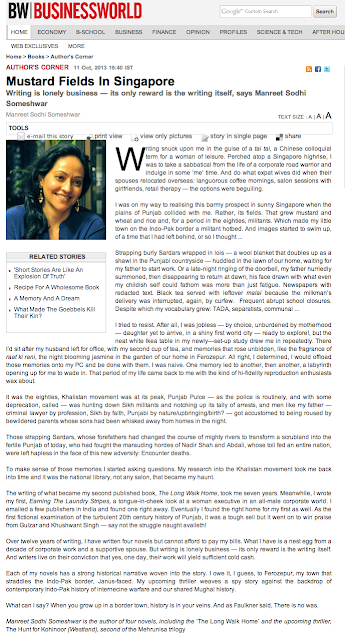 My research into the Khalistan movement took me back into time and it was the national library, not any salon, that became my haunt. The writing of what became my second published book, The Long Walk Home, took me seven years. 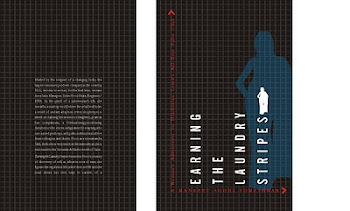 Meanwhile, I wrote my first, Earning the Laundry Stripes, a tongue-in-cheek look at a woman executive in an all-male corporate world. I emailed a few publishers in India and found one right away. Eventually I found the right home for my first as well. As the first fictional examination of the turbulent 20th century history of Punjab, it was a tough sell but it went on to win praise from Gulzar and Khushwant Singh - say not the struggle naught availeth! Over twelve years of writing, I have written four novels but cannot afford to pay my bills. What I have is a nest egg from a decade of corporate work and a supportive spouse. But writing is lonely business - its only reward is the writing itself. And writers live on their conviction that yes, one day, their work will yield sufficient cold cash. Each of my novels has a strong historical narrative woven into the story. I owe it, I guess, to Ferozepur, my town that straddles the Indo-Pak border, Janus-faced. My upcoming thriller, The Hunt for Kohinoor, Book 2 in the Mehrunisa trilogy after the bestselling The Taj Conspiracy, weaves a spy story against the backdrop of contemporary Indo-Pak history of internecine warfare and our shared Mughal history. What can I say? When you grow up in a border town, history is in your veins. And as Faulkner said, There is no was. We are reaching out to you in your capacity as one of India's leading book bloggers. Some of us bloggers have started a Facebook Page to showcase books by Indian authors and to feature all reviews by Indian bloggers. Request you to check out the page and leave links to any of your reviews of the featured books. Also if you want us to feature any books on our page, please let us know and we will do the needful.